Mauryan Empire Architecture: The Mauryan Empire was founded in 311 BC by the great emperor Chandragupta Maurya. Mauryan Empire was one of the most powerful and greatest empires in India. The empire lasted from 321 to 185 BC with Pataliputra as its capital. Mauryan Empire is regarded as the first major empire in the history of India. This period was characterized by unprecedented growth in art, literature, religious thinking, architecture etc. 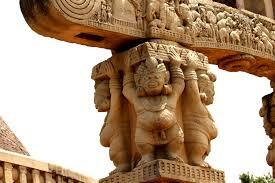 The Ashoka pillars are the finest expression of the Mauryan art, architecture, and engineering. A pillar consists of one piece of stone supporting a capital made of another single piece of stone. The stone is highly polished and gracefully proportioned while the polish was lustrous. Substantial engineering skill was required to construct them. Pillars required large blocks of stone dragged from distant quarries. The Sarnath lion pillar is the most notable among all. It has become the national symbol of India. It is used in coins and currency notes today. The lion capital depicts an inverted lotus or bell is a round drum, decorated with four wheels, Dharma Chakra, with 24 spokes and figures of animals like the lion, horse, bull and an elephant. Above the drum are four lions seated back to back. The Sanchi stupa was built with bricks, having a height of 23 meters. Ajanta caves are yet another example. The city of Pataliputra has been described as the most beautiful city by many because of the numerous palaces, towers, and pavilions. According to Megasthenes, the city was encircled by a massive timber-palisade, pierced by loopholes through which archers could shoot. It had sixty-four gates and 570 towers. 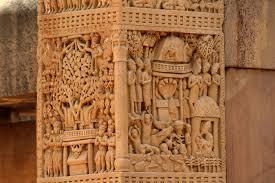 The main building material during the Mauryan period was wood. Numerous stupas including the Sanchi stupa were also built by Ashoka the great. Stone masonry was introduced by the Mauryans. The Sanchi, Sarnath and Amaravati stupas were built during the reign of Ashoka. 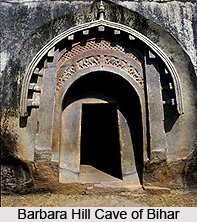 The four rock-cut sanctuaries on the Barabar hills and three on Nagarjuni hills near Gaya, Bihar are standing testimony to Mauryan sculpture and rock cutting. “These palaces are so beautiful and excellent that they appear to be the creation of God rather than of men”, remarked a Chinese traveler on seeing the palaces during the Mauryan period.